Nerves and Nerve Injuries is the first comprehensive work devoted to the nerves of the body. An indispensable work for anyone studying the nerves or treating patients with nerve injuries, these books will become the ‘go to’ resource in the field. The nerves are treated in a systematic manner, discussing details such as their anatomy (both macro- and microscopic), physiology, examination (physical and imaging), pathology, and clinical and surgical interventions. The authors contributing their expertise are international experts on the subject. The books cover topics from detailed nerve anatomy and embryology to cutting-edge knowledge related to treatment, disease and mathematical modeling of the nerves. 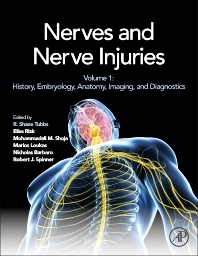 Nerves and Nerve Injuries Volume 1 focuses on the history of nerves, embryology, anatomy, imaging, and diagnostics. This volume provides a greatly detailed overview of the anatomy of the peripheral and cranial nerves as well as comprehensive details of imaging modalities and diagnostic tests. What are the Cranial Nerves? Dr. Tubbs is lead researcher in Pediatric Neurosurgery. He is Editor-in-Chief of the journal Clinical Anatomy, is author/editor of multiple books, and is a new editor for the 41st edition of Gray’s Anatomy. Dr. Rizk is a neurosurgeon at the Penn State Hershey Medical Center with a clinical specialty in pediatric peripheral nerve surgery. He has multiple publications on the PNS and is active in basic science research regarding peripheral nerve regeneration. Physician and anatomist for the Department of Ophthalmology at the Indiana University School of Medicine who has written extensively in the field of anatomy and on the peripheral nerves. Chair and Professor in the Department of Anatomical Sciences at St. George’s University who has written extensively in the field of anatomy and on the peripheral nerves. Dr. Robert Spinner is a neurosurgeon in Rochester, Minnesota. He is affiliated with multiple hospitals in the area, including Mayo Clinic and Mayo Clinic - Saint Marys Hospital. He received his medical degree from Mayo Medical School and has been in practice for 25 years. He is one of 17 doctors at Mayo Clinic and one of 13 at Mayo Clinic - Saint Marys Hospital who specialize in Neurological Surgery.